When Filifili and I headed to the US Navy boat and instead ended up on the Greenpeace boat, our tour had a question and answer portion. Our seafaring tour guide spoke no Samoan, and I hardly expected anyone in our group to ask a question; afterall, whenever I ask my classes “E iai se fesili?” I only get blank stares. But one man raised his hand. “Our carbon emissions in Samoa are low compared to the rest of the world. What more can we do?” We all shifted our eyes to the tour guide, who said something about the climate change conference in Copenhagen coming up in December, but an indepth answer to the man’s question could be the subject of a days-long symposium. It’s clear Samoa is being affected by climate change. Traditionally October is the beginning of the wet season, but the last significant rainfall was at least two or three weeks before the earthquake. I remember being only a couple days into training last year before we saw our first storm. Supy, Dan, and I stood at the window of our hotel room, all of us in awe of the tropical downpour. This year, the climate is that of a desert; the air is dry, and the few times the sky has become overcast, the clouds brought no water. Last April, the beginning of the dry season, we had 9 straight days of torrential rain. On Palm Sunday I took a picture of my shadow because it was so exciting to see the sun again. The tsunami upended a lot of dirt and dust on the south coast, and the saltwater killed off a lot of the plant life down there, and with no rain, the dust in the air has been awful On trips back and forth to Lalomanu, people would stop us to ask for masks, which we never had. But the man on the Greenpeace tour was right. 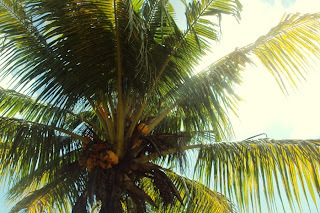 Samoa has a relatively light carbon footprint and is still seeing the nasty effects of global warming. That said, there’s always room for improvement. Owning a car is rare in many of Samoa’s more rural villages, but the few cars on Samoa’s roads are not the cornerstone of fuel efficiency. 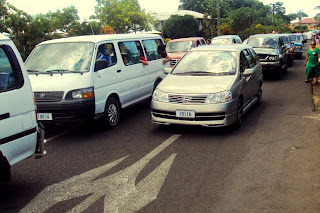 Buses would seem to be worst offenders, but taxis and privately owned cars can be nasty. Walking the streets of Apia can leave a nasty taste in your mouth. With the heat, it seems more sensible to take a taxi than to walk. The taxi burns petrol fumes into the atmosphere. The climate gets hotter. With the heat, it seems more sensible to take a taxi than to walk. The vicious cycle continues. Trash is a growing problem in Samoa. Many families, my host family and school included, burn their trash. Efforts have been made for trash collection and the creation of landfills to moderate success. Trash bins were placed around our school at the beginning of the year, but I’ve never seen who empties those. A number of Peace Corps volunteers have started composting programs in their village to moderate success. Either way, Samoa’s environment is definitely changing and the less that can be done to expedite that change, the better. 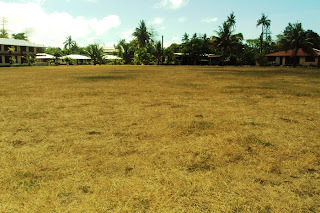 Grass on my school's field is dry and dead from the recent dry spell. 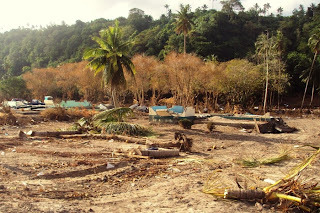 Debris, dirt, dust, and dead trees on the south side of Upolu. Hmm, that is not how grass normally looks in Samoa. It is lush green and a pain to cut and sweep!